At first blush CivWorld appears to be a fairly standard city-building game similar to CityVille. You build buildings, and depending on how you place them different things will happen. 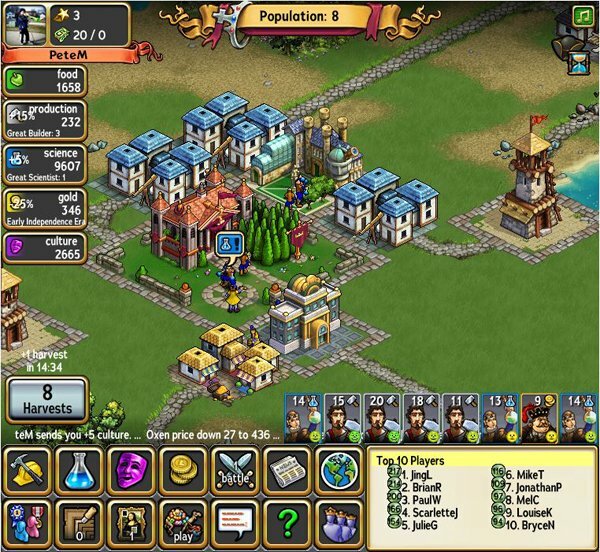 But, as the name implies, it's a game about building a civilization, not just a city. And key to this are the various resources you'll be gathering. These cover five different aspects of your budding civilization, including food, science, culture, production, and gold. And depending on where you decide to focus your society will develop in different ways. A focus on cultivating food, for example, will allow your population to grow faster, while focusing on science will allow you to develop new technologies like writing or the ability to build a university. 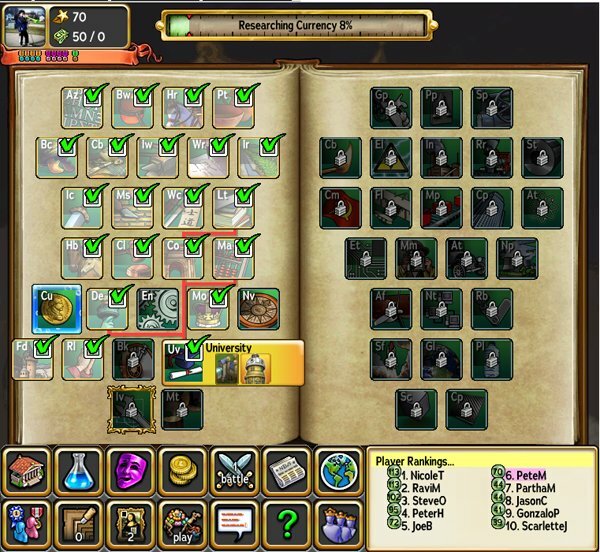 Your citizens regularly produce these resources and you can also collect "harvests" so that you can gather even more of them while you're online. And the happier your citizens are the more resources they will produce. Placing farmers next to one another will make them happier and more productive for instance. Just like having scientists live near a library will make them happier. There are so many variations for how you can place homes and buildings, and even a slight tweak can have a big impact on your resource production. There's also a market where you can buy both military units and specific resources, and it works in the way that a real market does. So if you buy lots of food it will drive the price up, whereas if you sell lots of it the price will go down just as in Supply and demand. 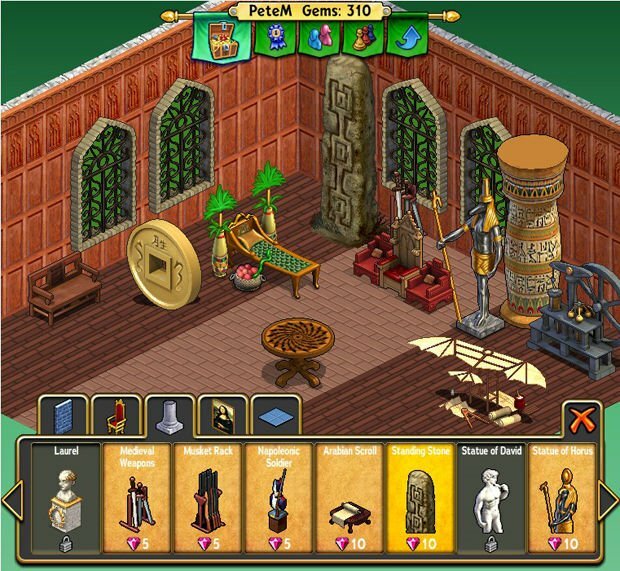 There are also several mini-games, including a culture one where you have to rearrange a famous painting like a puzzle. 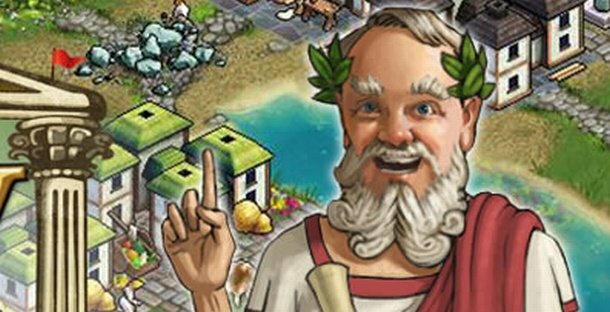 There's a large focus on social play, CivWorld lets you play simultaneously with players who don't have to be on your friends list. There's a live chat so that you can co-ordinate with other players, and you can join forces with others by forming a civilization that will allows you to pool some resources so that you can build wonders, which unlock special bonuses. You can also choose to invade other civilizations and your chances of victory depends on the overall power of your team. If you do get stuck there's a built-in hint system called the Civilopedia that explains some of the more complex aspects of the game. And we can't wait to learn them all.